Avista and Itron are undertaking a hometown smart city project, from smart meters, streetlights and air sensors to distributed energy trading. Here’s how it will work. Spokane, a city of some 210,000 people in the foothills of eastern Washington state, is not the first place that comes to mind when one thinks about cutting-edge smart city deployments, or the latest efforts in transactive energy. But utility Avista and smart metering giant Itron want it to earn its place on that map. At Itron Utility Week last month, Itron and Avista laid out some details of their participation in an urban renewal project, called Urbanova, which will use Itron’s meters and wireless networks as the foundation for a broader internet of things (IOT) rollout. Two years in the making, Urbanova’s plan was formalized in September with partners including the Spokane city government, engineering firm McKinstry, and Washington State University. The project in Spokane’s 770-acre University District will start with networked streetlights -- a fairly common and cost-effective smart city application. But it will eventually grow to include air quality sensors, medical devices, and distributed energy resources (DERs) such as solar panels, behind-the-meter batteries, plug-in electric vehicles and energy-smart building control systems. It’s the first smart city project of its kind in Washington state, though only one of many being tested out around the world. It’s also a showcase for Itron’s next-generation technology platform, dubbed Riva. Finding ways to extend smart meter networks’ capabilities and business cases has long been a part of the Liberty Lake, Wash.-based company’s plans, along with those of competitors like Silver Spring Networks and Toshiba’s Landis+Gyr. Itron and Avista are well known to one another -- in fact, Itron was spun out of Avista in 1977. The two have been working on AMI since 2009, when Avista rolled out 13,000 Itron meters in Pullman, Wash. under a federal smart grid investment grant. In May, Avista picked Itron for a broader rollout across its 375,000-customer service territory over the next six years, featuring its OpenWay Riva technology, which is deployed with grid routers and networking technology from partner Cisco. While contracts are still being finalized and deployment schedules haven’t been set, the University District will be an early target. The benefits of AMI for Avista will start with the core meter-to-cash proposition, Kirkeby said. They’ll also use the meter data for revenue protection -- finding wasted or stolen electricity -- and pinpointing outages in its distribution network, which are common uses for a growing number of smart meter-equipped utilities today. In the meantime, Avista has rolled out some significant smart grid projects. 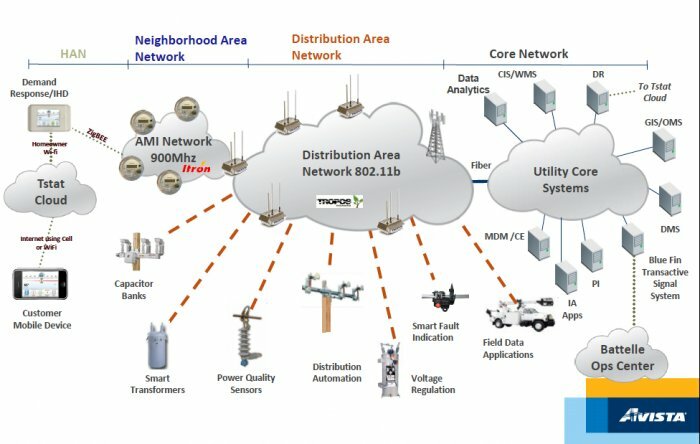 Its largest, funded by a $20 million investment grant in 2009, is a distribution automation (DA) project that covers about one-third of its customers, featuring wireless networks from ABB’s Tropos and substation automation, smart switches and digital relays from grid vendor Efacec ACS. Beyond preventing and limiting outages, Avista has been using its DA system to do conservation voltage reduction (CVR), or fine-tuning voltages at different parts of the grid to save energy. Smart meters will be able to provide minute-by-minute data on energy, voltage and power quality at the endpoints of the grid, a critical piece of data for a system that must keep every customer within certain voltage limits. Next, Avista plans to extend the smart meter wireless network to non-grid devices, particularly those it doesn’t own, Kirkeby said. This is a realm where most AMI projects haven’t gone yet, since only the latest technologies, like Itron’s Riva or Silver Spring’s Starfish platform, support real-time, two-way communications across technology standards outside the utility realm. To test this capability, Avista is starting with streetlights. Last year, it embarked on a 28,000-streetlight LED replacement program, driven by the energy savings and reduced maintenance costs. These LEDs also come with digital controllers that offer a lot more flexibility than old-fashioned high-pressure sodium lights, making them useful targets for connecting to the network. They’re also distributed around the city, making them useful nodes for extending it to more devices. This is an important new market for Itron. Riva has supported streetlight connectivity since last year, but Itron hasn’t announced nearly as many deals on this front as has rival Silver Spring Networks, which bought vendor Streetlight.Vision in 2014 and has tens of thousands of lights networked in the U.S. and Europe. But there’s plenty of competition for traditional AMI vendors to contend with in this space, including giants like Verizon, which acquired LED networking startup Sensity Systems this fall, or GE’s Current, which bought Daintree Networks in April. Moving from energy assets to the broader world of IOT devices, Itron and Avista will start with air-quality sensors being deployed as part of a five-year, $1.5 million project with researchers from WSU’s Voiland College. WSU already runs one of the country’s most effective air-quality monitoring programs through its Laboratory for Atmospheric Research, and it’s a big partner in Avista’s Pullman microgrid projects. The goals of the Urbanova deployment combine both fields, to “monitor, predict and control energy and air quality in an urban environment and to record resulting health impacts” on people living and working in the University district. “Health monitoring is a core area where we’re leveraging the IOT platform” that Itron provides, Kirkeby said. Spokane’s University District is the home of three medical schools, and they’re going to be looking at the potential for using the Urbanova wireless network to connect different types of medical devices, he said. Beyond that, there’s a lot of room to add connectivity with Itron’s platform to the new construction being promoted for the district’s undeveloped parcels. These types of applications are still years out, though. While the Urbanova partners have signed a memorandum of understanding, they haven’t gotten to the nitty-gritty details of how they’ll share responsibility and ownership of the devices and data that will be part of this networked vision. In August, the Urbanova partners got a $7 million grant from the state’s Department of Commerce to launch the distributed energy portion of its project. It will start with a microgrid, planned to include 200 kilowatts of solar from two arrays and a combined 2.5 megawatt-hours of battery storage, and integration with the two buildings’ energy management systems. While eastern Washington isn’t the hottest spot for rooftop solar, Avista is the host of the state’s first community solar project, a 425-kilowatt array that will serve more than 500 residential and commercial customers. The utility also has a pressing need to manage the ups and downs of the state’s wind generation, which can reach up to 17 percent of overall supply at times, and can’t be curtailed even when it’s producing more power than is needed, Kirkeby said. Avista also has a fair share of experience with batteries. Since April 2015, it’s been operating a 1-megawatt, 3.2-megawatt-hour vanadium redox flow battery from UET, which is also working on the shared energy economy project, at a substation in Pullman, providing load shifting, frequency regulation, and voltage regulation. One of the biggest customers served by that substation is grid technology vendor Schweitzer Engineering Laboratories (SEL), which is also providing the microgrid controls for the Urbanova project, he said. That will give Avista the tools to monitor and control each of its grid-connected energy assets, whether they’re controllable loads within buildings, or the inverters that connect the project’s solar arrays and batteries to the grid. Beyond technically controlling these DER interactions, the shared energy economy project will be extending the work of the regional Pacific Northwest Smart Grid Demonstration Project. This multi-year project, involving 11 utilities and the Bonneville Power Administration, connected 27 different “nodes” across the Pacific Northwest’s transmission grid to calculate current and predicted electricity demand and costs, and communicate those values to power plants, industrial demand response systems and behind-the-meter controllable loads like adjustable water heaters and batteries. The shared energy economy project will shrink this concept down to the scale of the local distribution grid. “We’re working on methodologies for valuing different DERs,” including solar PV, energy storage and natural-gas-fired turbines. Avista is studying the potential for battery power to support critical loads such as the area’s medical facilities during outages like the one caused by a freak windstorm last year, he said. But it will also be asking its batteries and controllable loads to perform valuable tasks when the grid isn’t down, from balancing out ups and downs in solar output to providing reactive power to help stabilize voltages, he said. 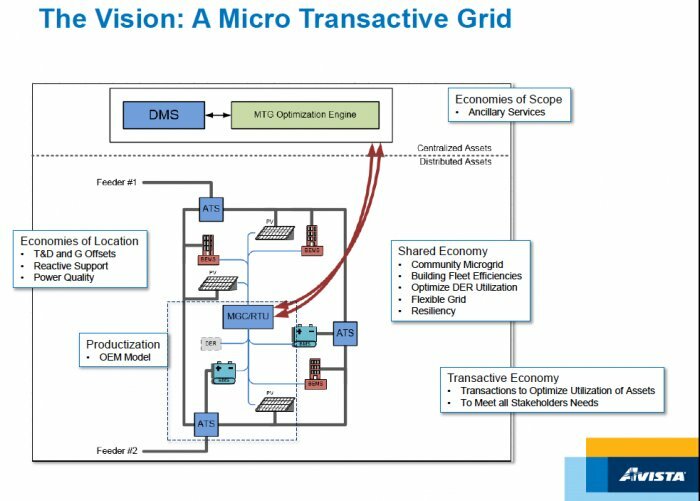 This chart from a recent presentation on the project (PDF) shows how the system will be configured, with SEL’s microgrid controller receiving optimization data from the utility’s DMS, collecting the status and availability of its various DERs, and controlling them to serve a ranked series of grid needs. This kind of “transactive microgrid” architecture is on the cutting edge of microgrid technology, and is being tried out in a select set of pilot projects, including several being funded by ARPA-E's $33 million NODES program, as well as the U.S.-Canadian Transactive Energy project that’s linking microgrids in Maine, Nova Scotia and Toronto.